With the news already out that a live-action take on the famous Monkey Punch (モンキー・パンチ) manga/anime franchise, fans are clamoring for a teaser of the film. They weren’t disappointed as a trailer has been shown via the TBS morning show, Asachan on Monday. Arsene Lupin III (ルパン三世) has inherited his grandfather Aresne Lupin’s skills in thievery and has earned the title of the world’s number one thief with every law enforcement in every country looking out for him. Lupin is rarely seen without master marskman Daisuke Jigen (次元 大介) and renegade samurai Goemon Ishikawa XIII (十三代目 石川 五ェ門). Their little team is often joined by Lupin’s on-again, off-again girlfriend, Fujiko Mine (峰 不二子) who often takes advantage of Lupin’s situations for her own benefit. Of course, tailing them constantly is the comical Inspector Koichi Zenigata (銭形 幸一) who has made it his life’s dream to throw Lupin behind bars once and for all. The live-action film will center on how Lupin’s ragtag team first came about. Each member has his (and her) eyes on the Crimson Heart of Cleopatra, a treasure that “unites the world” to whomever possesses it. The Crimson Heart of Cleopatra is tucked within the walls of the Ark of Navarone, a safe house that resembles a fortress with a nearly impenetrable defense system. 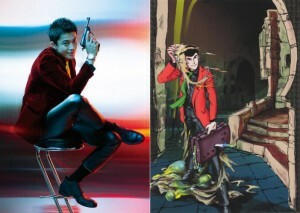 Playing Lupin III is Shun Oguri (小栗旬) with Tetsuji Tamayama (玉山鉄二) as Jigen and Gou Ayano (綾野剛) as Goemon. Lupin’s ladylove Fujiko will be filled in by Meisa Kuroki (黒木メイサ) while Lupin’s highly obsessed inspector (and sometimes friend) will be played by Tadanobu Asano (浅野忠信). Missed out on the Asachan Lupin III segment? You can check it out below. Tell us what you think about this live-action take on the comments section!